There is a flood of content published online every day. Unless your content stands out, attracts and engages your prospects – it’s gone. Your efforts are wasted. How do you make your content pay off? How do you convert it into customers and sales? I’ve created programs to answer both these issues. 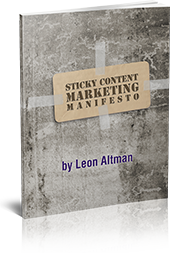 Programs to enable you to create sticky content – the kind that sticks, stands out, and spreads. And programs to show you how to raise conversion rates with copywriting that persuades, convinces and connects to emotional hot buttons. Plus, important marketing funnels that connect content to conversion. These coaching and consulting programs have been developed out of my many years of experience as a copywriter and creative director at top agencies and companies. As well as marketing I’ve created for entrepreneurs as well as for my own business. You’ll find a list of programs for entrepreneurs at: Sticky content and copy programs. Fill out the form there to let me know what you’re interested in. Also, feel free to put in any questions and challenges you face. I’ll get back to you with helpful information. Check out the programs at Sticky Sticky content and copy programs.